Trucking runs in my family! It's okay to not have it as I get home most weekends. Just not a fan of idling burning fuel. What do people do for summer idling? I haven't posted in a long time but I've been working on the road for a few months. During the winter and spring I didn't have to idle. Now in the summer I can't sleep in weather that's 85 and above. It's currently 95 degrees in Tennessee. I'm trying to save fuel for company points. What do you guys do on weekends you run? My truck doesn't have APU, just bunk heater. We had Steve work there, not sure if he still does. Tried connecting to him on here but no response. I know I'm proud of myself on how much I've accomplished. It'll be a whole new experience on the next step. I chose the company I was interested with in my second week of school. I decided on TMC because of what they offered and they were the best decision for myself and my wife. It was definitely difficult weighing pros and cons of over the road. Especially, the con of leaving my wife for a few weeks. I know that we can definitely handle the time apart since she has a really good job and the house to come home to. I know I'll be pushing myself harder every day for orientation. I'm that type of guy where I remain calm and just keep going forward. I learned a lot about myself during driver training and I know I can do it. As for now I'll be posting updates when I can. Just wanted to say thanks to this site for allowing me to learn more every day. Shout out to my school, I passed! As of yesterday I passed my driver exam. I now have my Class A. I want to thank my college of choice Century College in Afton MN. Wonderful school and great instructors! Tomorrow I test for my Class A license! I'm nervous, but I'm also confident I'll pass. I just graduated from Century College today, we had our final session today. I completed 180 hours of classroom and driving time. I'm looking forward to my next adventure! I'll combine our make up day with day 20. On Tuesday I was in a tie for the most obstacles completed on the range. Which the other person and myself had a sudden death style of a combination of obstacles. We had to complete Blind-Side parallel and a 180 reverse dock. The person who completed most obstacles won. And......I came in FIRST!!!! I was very proud of myself. On our final day today we we're doing all the exam practice items, offset, 90 dock, backing, and on the road driving. I'll be testing tomorrow afternoon so I'll be coming into class around lunch to practice my pre-trip and obstacles. Tonight I'm clearing my head to regain my focus. That's it for Century College in Afton, MN. It was a great bunch and a great crew of instructors! It was another good day after a great weekend with my wife. Today I drove 2 hours on the road, some good driving today. I also did a blind 90 dock, that was fun. I also succeeded in a 180 dock park, that was really fun! All in all it was a good day of practice. Tomorrow will be more driving and final class time with a quiz. Wednesday is our make up day to get 180 hours completed, all driving time. Just getting anxious for Thursday! With the previous day of no class due to weather we hammered hard into learning classroom time. We went on the range to practice more and had our driving time out on the road. With a class of 9 it usually works out great for driving and range time with 6 trucks. I still think this is a great program from Century College! More classroom and driving time and it's just great to have the 9 hours every day to get all the practice in. We had a nasty storm, so we ended up using this day to get caught up from Monday missing class time. That was trip planning and map usage, which I like reading maps. I'm ready to use maps in the real world for trip planning. Once the storm settled we just had range driving time which is backing, 90, offset, parallel, tunnel dock. It was a great day, I got my Wisconsin Pre-Trip checklist. This is the final checklist so it's shortened quite a lot! I'm ready for it and I'm confident. I was also told when I test and I take my exam on Thursday, confidence is key! I'll be preparing with my final days to get all the things in line to pass my exam. Every last minute will be fixing any mistakes and making myself a better driver. I'm a few days away from testing, and we have 3 days left of class, can't wait! My problem with my driveway is it doesn't look long enough. It's only a two car wide driveway and maybe 80 feet long to garage. With the snow banks at the end of driveway I don't think a truck and trailer would fit. I have called the flying J and they say I can park there just not for 3 days or longer. Which is fine, just worries me about winter. I'll be calling more places around my town. I know there's three trucking companies in my town alone. What does everyone else do for their home-time for parking? No school today, as it's -22F with a wind chill of -35F to -45F. It's not looking to good for tomorrow, as tonight/early morning we will be hitting -26F and wind chill around -55F. Might be cancelled, and that's a bummer. We test next week, and that just means I'll be pushing myself harder every day. Time to study my pre-trip some more! It was another good day of classroom learning, and essentials. Today we were learning the tunnel dock, so I tested out of that as well. I've been trying to do more challenging things everyday so I know how to maneuver the 53' trailer better. It's interesting how tight spots can be with something that large. On the road I was shifting smoother and travelled to my first weigh station, pretty basic information they just pass you through with arrows. We had nasty weather in the morning with it being super cold and windy but it warmed up to 32 by noon. Monday is supposed to be -30 and below with wind-chills. There were accidents all along 94 in front the school. So, it was a slow day at start to take it easy and with the wind blowing. I was testing on parallel parking on the range, passed that with flying colors. I've narrowed down my decision for work, so I have that being set up soon. I'm excited for my next journey after school. We have another full week of class, then a weekend and two days of classroom and our test date for DOT. The truck stop is about 6 miles from my house. I just want to make sure I can start it in cold weather. I've seen the battery shut off switch on freightliner. That's good to know, too. The company I'm interested in says that the truck and trailer must remain attached. Does the diesel 911 work? I know I'm not going to have my own truck until end of March with training but I am looking at ideas for next winter. I have a question about parking. 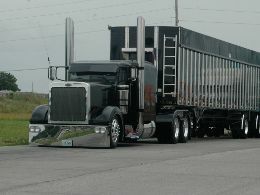 I live in between two truck stops and I can park there for home time as my driveway isn't big enough for the trailer. I live in Wisconsin and the companies I'm looking at don't have APU. So, my question is what do I do for the trucks to prevent battery draining and fuel gelling during my 2 days off? The company just says to park at a truck stop but it's also my responsibility. Thanks Old School! I should have my CDL by February 5th. Hey Josh I would highly recommend Century, it's very professional and it is a decent pace to learn. We've had some recruiters come from Dart, Werner, and Schneider. Tomorrow we'll have TMC showing up which is in my top three of companies I'm interested in. We had a long weekend and extremely cold weather so today was no fun. We did our usual classroom and range and road driving. Today we were learning the tunnel dock. I didn't get a chance to try it as I was testing out of my offset parking all day. I've been doing repetitions of daily tasks to keep remembering how to do them for the exam. It was a very cold and windy morning. There were accidents all over I-94 due to the icy conditions. Today was just interesting, I tested out of my lower gears for down-shifting, and I tested out of my 45 dock. It was another good day, and overall I'm just happy with my pace. I have high confidence in this program and in myself. Since day one I've noticed improvement every day! I should mention we have Eaton 10 speeds at this school. It's the uniform manual transmission out there and once you learn this you can learn anything else. Alright, I have to study for my quiz tomorrow and be ready for another good day of driving! Hey Troy Thanks for the info on modular. Larry, thanks for input on melton. I've been compiling a huge pros and cons with companies that are interested in me. They seem like a really great company. The downfall was the home time but my wife says she lists them as number one as do I. I have a big decision to make soon as I am graduating school in a couple weeks. And I'm looking to find a place to call home for work and making sure bills are paid.